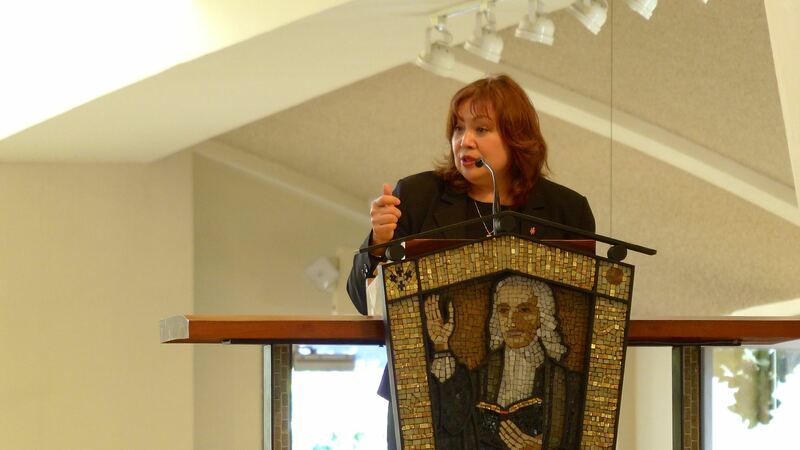 Speaking on the need for comprehensive immigration reform as a Christian imperative, United Methodist Bishop Minerva G. Carcaño of the Los Angeles Episcopal Area was the honored guest at the School of Christian Studies on Sunday, February 15, 2015 at San Diego First United Methodist Church. Bishop Carcaño’s address encompassed a number of stories from visits to the border as well as the socio-economic dynamics involved in mass-migration such as the North American Free Trade Agreement (NAFTA). Immediately following the address was a panel discussion which included Linda Sanchez, Adjunct Professor of Anthropology at City College (San Diego, CA), who is herself a “Dreamer,” and Rev. John Fanestil, United Methodist clergyperson with extensive ministry experience at the border of The United States of America and Mexico. In addition, at the event, Bishop Carcaño was given a prayer quilt from the Prayers & Squares interfaith outreach ministry. The ministry combines the gift of prayer with the gift of a hand-tied quilt. A heavy thread is used to take stitches through the quilt layers, and the ends are left free to be tied. Members of the congregation then finish these quilts by tying knots in the quilt after each worship service. As each knot is tied, a silent prayer is said for someone in special need, who then receives the finished quilt. 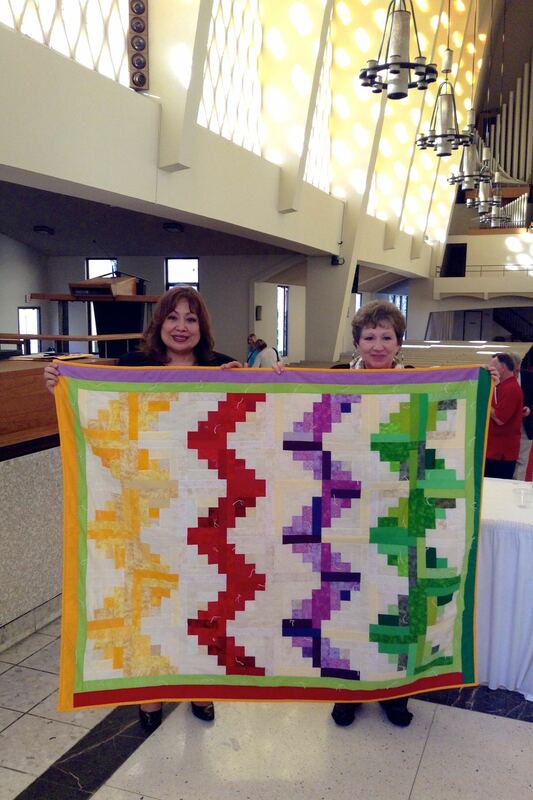 This particular quilt for Bishop Carcaño was selected by one of three Lay Leaders at San Diego First UMC, Lynette S. Williamson (as pictured above). 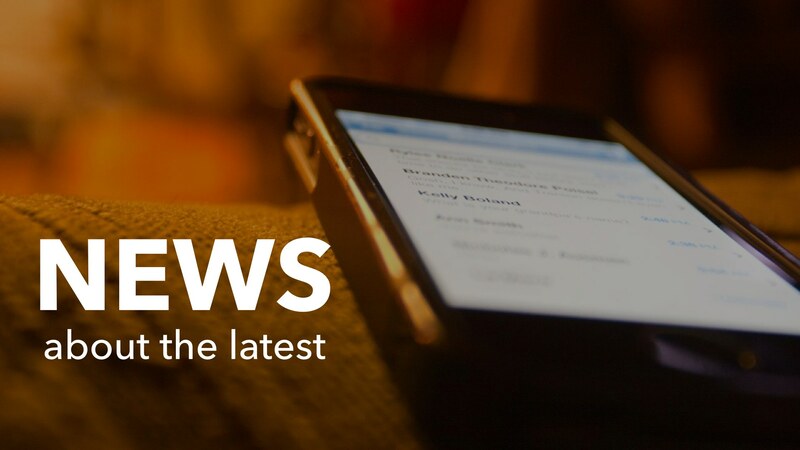 Available now is video of Bishop Carcaño’s address and panel discussion from San Diego First UMC.